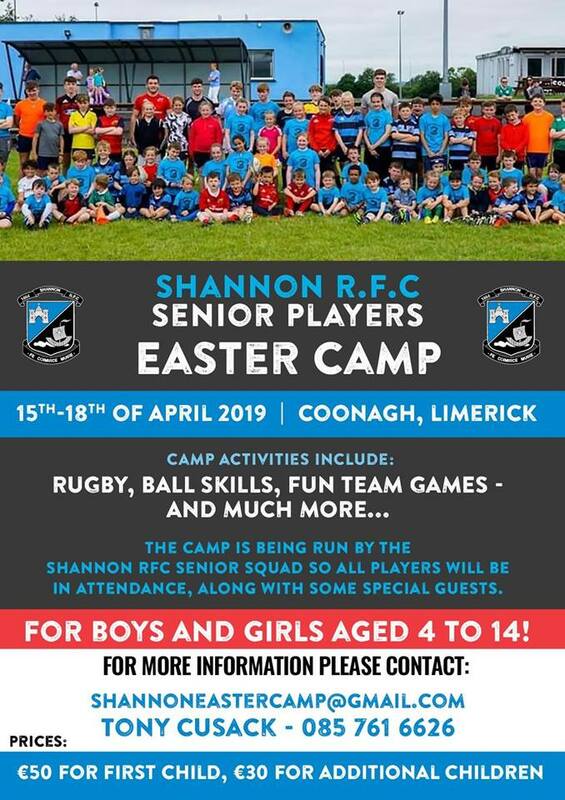 Notes W/E 17/03/19 | | Shannon Rugby R.F.C. This weekend is an important one for our senior teams! 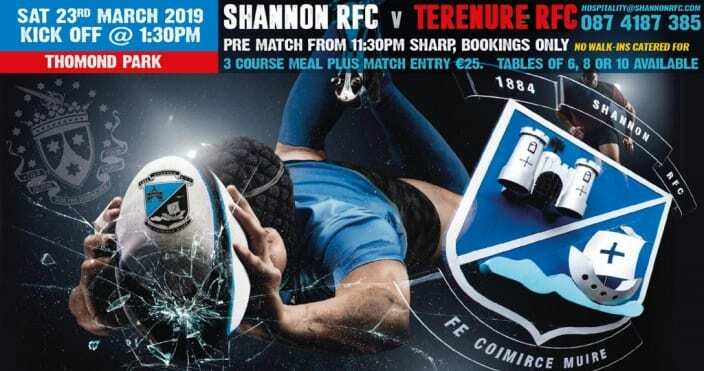 Our Firsts are back to league action as they welcome Terenure to Thomond Park in our second last home match of the league. Please take note of the earlier kick off time of 1.30pm. For this fixture we will be turning Thomond Park black and blue. All children who come along wearing a Shannon jersey get into the game with one parent for free! We will also throw in nuggets and chips for the kids after the game for free too! Kids are also welcome to bring a ball and enjoy kick about on the pitch at half time. FAO anyone attending Saturday’s game: There is strictly no parking inside or outside Thomond Park. Parking will be available in LIT’s car park and the back gate will be open for match day entry. Our Thirds kick off their Webb Cup campaign with an away fixture to Scariff on Saturday. Kicking off at 1.30pm its sure to be a great fixture. Hopefully our Thirds maintain their current form an come away with the win. Its an important weekend for our Ladies as they meet Tralee in the Munster Division 1 League final on Sunday. The match is set to be played in Tralee after a coin toss and the ladies will be getting a bus down with room for supporters. if you would like to travel let me know and I will book you a spot. This is the first of two finals that our ladies have reached after a fantastic season. We would like to wish them the very best of luck! Our Seconds got back on track with a win away from home in miserable conditions last Friday night in Cashel. Half time saw both sides even at 5-5 but Shannon dominated in the second half to get points on the board and come away with the win. We are now on top of the Seconds League Table with two games remaining. Its a weekend off this week but the seconds will be back in action over the next few weeks again. Our U16s girls were one of the few teams in action this weekend and produced a fantastic fixture against rivals Feathard and district. Kate Shanahan was the hero on the day bagging a first half try that was to be the only score in a very closely fought game. Well done to the girls who are through to the final this Saturday in Annacotty where they will take on Abbeyfeale at 2pm. 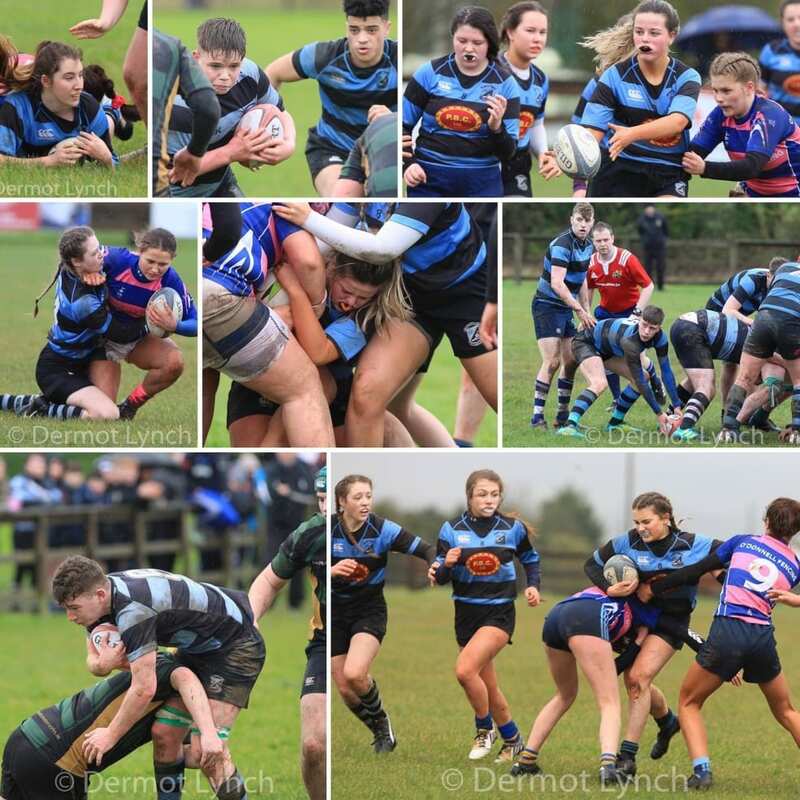 Our U18s had an unfortunate result in their Pan Munster Plate match v Mallow. Coonagh was the venue for the game as the wind and rain swirled around the pitch making conditions difficult for a match. Mallow came out on top by a scoreline of 22-8 seeing Shannon/St. Marys unfortunately exit the Plate. As always Dermot Lynch was on hand to take some fantastic photos! Once again, our Underage did us proud in the St. Patrick’s Day Parade. 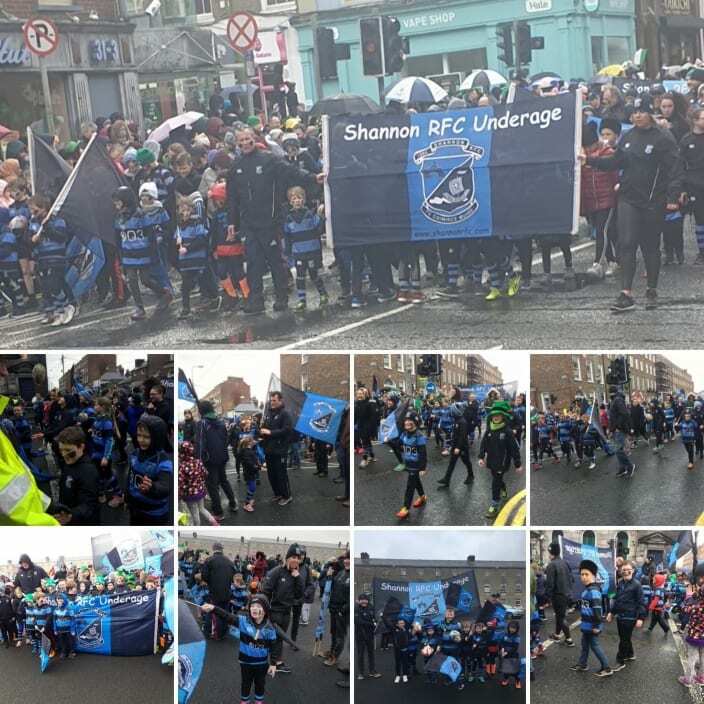 Great numbers showed up and turned a chunk of the parade black and blue and they marched down O’Connell street scrumming and singing as they went! Thanks to all players, coaches and parents who came along on the day! 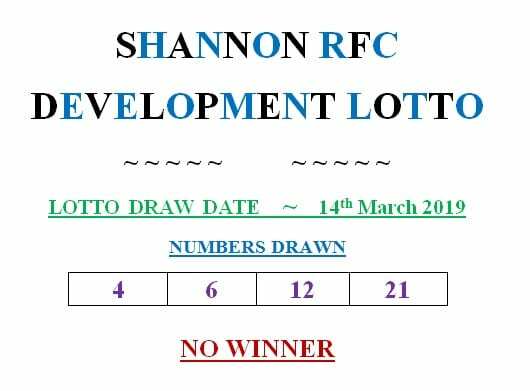 Next week’s draw is for €2,300 and will be held in The Mall Bar on the 21st of March 2019.